PennsylvAsia: Ambassador Gheewhan Kim and "Challenges in the Korean Peninsula: Nuclear, Trade and Economics", April 7 at Pitt. Ambassador Gheewhan Kim and "Challenges in the Korean Peninsula: Nuclear, Trade and Economics", April 7 at Pitt. 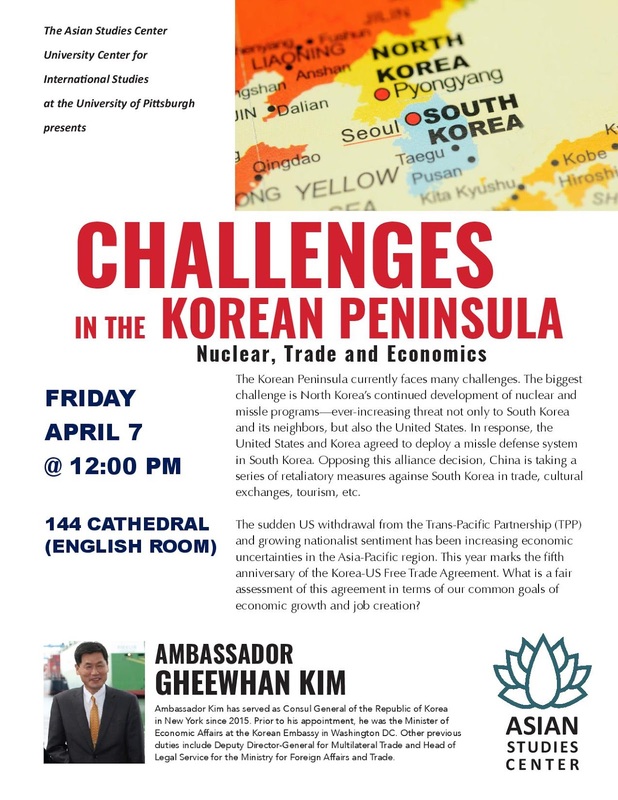 The University of Pittsburgh's Asian Studies Center will host Consul General of the Republic of Korea in New York Gheewhan Kim and his talk "Challenges in the Korean Peninsula: Nuclear, Trade and Economics" on April 7. The Korean Peninsula currently faces many challenges. The biggest challenge is North Korea's continued development of nuclear and missile programs--ever-increasing threat not only to South Korea and its neighbors, but also the United States. In response, the United States and Korea agreed to deploy a missile defense system in South Korea. Opposing this alliance decision, China is taking a series of retaliatory measures against South Korea in trade, cultural exchanges, tourism, etc. The sudden US withdrawal from the Trans-Pacific Partnership (TPP) and growing nationalist sentiment has been increasing economic uncertainties in the Asia-Pacific region. This year marks the fifth anniversary of the Korea-US Free Trade Agreement. What is a fair assessment of this agreement in terms of our common goals of economic growth and job creation? The talk begins at 12:00 pm in the English Room (room number 144) on the first floor of the Cathedral of Learning (map). It is free and open to the public.